I was absolutely shocked last week when walking home from work I saw a new bar had opened up in the old Pete’s Saloon space on 3rd avenue. I never even saw them doing work on the building. It was called Exchange bar and looked to have a pretty sleek space and large open windows in the front. So on Sunday Mr. T and I swung by to check out the food and drink. Exchange has a narrow interior with a long bar up front and smaller candlelit tables in the back. Three big flat screen TV’s sit behind the bar giving us prime viewing of the basketball games. I thought the space was nice in every way except for the running red beer prices above the bar. I guess that is supposed to look like the stock exchange maybe? I don’t know- I found it very distracting. They had a decent selection of beers on tap- Blue Moon, Stella, Guinness and Magners were some of the options. I was in a wine mood so I got a glass of Chardonnay instead. Now since they had only been open about 2 weeks I was a little scared to try out their food. We both decided a burger was probably a safe bet and we split just in case it was terrible. Seeing it come out of the kitchen I was really glad we decided to split. It looked HUGE! And it was pretty huge. The massive bun really threw me off a bit. I was already worried that such a large bun would detract from the meat in the burger but I was dead wrong. The roll was so light and fluffy it squished right down and soaked up the beefy juices from the meat. Ahhh yes the meat. Also quite a surprise. As soon as I took my first bite I was transported back to summer grilling days growing up. 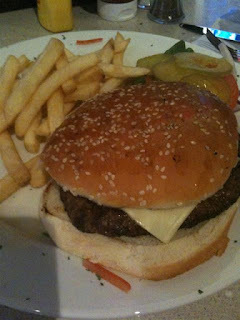 This burger had that wonderful crusty chargrilled flavor on the outside and a thin but juicy inside. It could have been cooked slightly more on the rare side but was incredibly tasty nonetheless. The fries were nothing special- a little too soft and fluffy for my tastes but the cheese and pickles were great. They used a white American cheese instead of orange and the pickles were reminiscent of McDonalds. I don’t know about you but there’s just something I love about McDonalds pickles and these had the same size, shape and taste. 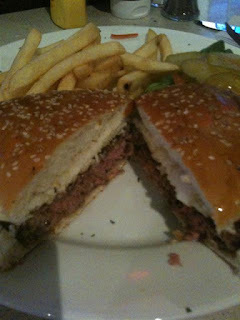 Mr. T and I were both surprised how much we liked this burger. I don’t think it will knock off any of my favorite burger places just yet but it’s a wonderful new option to have in the neighborhood. UPDATE: Just got an email from Thrillist about the place. Apparently the running red ticker will soon show fluctuating beer/drink prices according to market demand. For example, if you have a group of ten people all ordering Stoli and Soda, the price could actually drop after each round. Interesting concept. We'll see how it works.